Back for its fourth year! Same great night, this time with headliner Jimmy Graham (Comedy Central, Oxygen Network), featuring Sean Morton and your host Rob Epple. 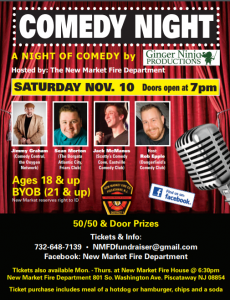 Doors open at 7PM for dinner, with the comedy show to follow – and make sure to stay for the door prizes and 50/50! Tickets are only $25 – call 732-648-7139 to reserve!